Late on Christmas Day, I picked up An Old-Fashioned Girl by Louisa May Alcott. I’d just finished watching the excellent 1994 version of Little Women and was feeling deeply nostalgic for Alcott, whose books (both the good and the very, very bad) I’d devoured as a child. I’ve never particularly liked Little Women and its sequels (the rare case of the movie being more palatable to me than the book) but I’ve held on to my favourite Alcott books into adulthood. I revisit them occasionally but it had been a few years since my last Alcott encounter, when I reread (with some reservations) Eight Cousins and Rose in Bloom. On Christmas Day, I was in the mood for something old-fashioned and comforting and An Old-Fashioned Girl more than satisfied. It, alongside L.M. Montgomery’s Anne books, is one of the rare volumes that delight me as much now as it did when I first read it twenty years ago. The story begins when fourteen-year old Polly Milton comes to Boston to stay with her friend, sixteen-year old Fanny Shaw. Though the two girls had become fast friends when they met the previous summer, Fanny’s city life is a surprise to country-bred Polly. Polly is amazed by her friend’s grown-up ways and very grown-up clothes. Amazed but, to Fanny’s bewilderment, not particularly envious. Though younger than her friend, Polly is in no particular hurry to grow up. Not if it means wearing fussy clothes, never being able to run or toboggan, or being too sophisticated to play with Fanny’s younger siblings, fourteen-year old Tom and six-year old Maud, or be petted by the very loveable Mr. Shaw and his sweet mother, known to all as Grandma. This is familiar stuff for Alcott fans: she loved to moralise about the virtues of wholesome innocence versus the corrupting effects of high society and vanity. She just didn’t always do so persuasively. Why couldn’t Meg March have one fun, guilt-free evening of flirting and pretty dresses? Why did Rose Campbell have to be so violent in her disdain for “fashionably fast girls”? And, most melodramatically of all, why did Charlie Campbell have to die to prove his creator’s point that frivolous pursuits are poisonous? She takes a thankfully less heavy-handed approach here and it makes for a much better book. Polly may be a little more prim than her friend (as Grandma Shaw says, Polly hasn’t “yet learned that modesty has gone out of fashion”) but both girls are kind and loving and generous. The important difference Alcott shows us is that Polly, by embracing her true age, is free to have more fun and develop more meaningful relationships than Fanny can experience in her guise as a proper young lady of fashion. Polly need not substitute sweets for meals, gossip instead of learn while at school, squeeze and stuff herself into a decorative but impractical dress, or put on airs when introduced to a young man. She eats well, moves freely, and is able to enjoy the company of everyone she meets, young or old, male or female. On top of all this, Polly has a gift for living: she appreciates all the opportunities that come her way and, most of all, she values the people in her life. In the first section of the book, that is her main value: she teaches the Shaw family to show their affection for one another. They had been a loving family before but in a more distant, absentminded way. The siblings squabbled, all three were relatively thoughtless when it came to their parents, and, with the exception of Tom, they took their grandmother for granted. With Polly as a gentle example, Maud and Fanny find themselves spending more time with their grandmother, all three begin to think more about how to lighten their father’s cares, and they even attempt to make friends with one another (not always successfully, but they get credit for trying). This first visit cements Polly’s friendship with the Shaw family. Four years later, when the story resumes, the relationship is just as strong. Now a young woman of twenty, Polly has moved to Boston, found a room in a boarding house, and is teaching music to help pay for her younger brother’s university education. Her days are busy between her teaching and her new friendships, but not too busy to see her old friends. Grown-up (or, given that they are all still very young, more grown-up) Polly, Tom, and Fanny are more interesting than they ever were as children, perhaps because they all have more problems. Fanny is languishing at home, with no purpose and no prospective husband in sight; Polly is busy all the hours in the day, between her teaching, her charitable efforts, and her new friendships with other young, determined, independent women (a fascinating group, particularly when you consider that the book was published in 1870); and Tom, poor, loveable Tom, has, I’m sorry to say it, turned into a bit of a dandy. He spends too much, doesn’t take his schooling at all seriously, and has gotten himself engaged to a singularly awful girl. Tom has always been my favourite Alcott character, so kind and big-hearted but full of reassuringly human failings, that his struggles pain me as much as they do Polly. After a number of ups and downs, there are happy endings for Polly, Fanny, and Tom (little Maud, however, gets completely betrayed by her creator and is sentenced to a life keeping house for her father). I’ve read this book so many times I’ve lost count but this was the first reading where I really appreciated the strength of the romantic relationships Alcott creates. Fanny’s match is somewhat fairytale-esque but Polly’s feels excitingly real. So many books glamorize the idea of an alpha hero, someone to take charge of situations and, all too often, the heroine. Here, we have instead a healthier, more equal model for a marriage: a true partnership between two young people, just starting their lives. Even before their marriage, we see Polly comforting and advising her future husband, pushing back when she disagrees with or is disappointed in him. Polly doesn’t choose a husband who is perfect or who can rescue her and solve all her financial concerns: she chooses one who she will work hard beside to build the life they want. And that is a rather lovely, special thing to see. Diana, I agree that Fanny’s marriage isn’t too fairytale-esque,just a touch more than Polly’s. And that certainly doesn’t keep me from thinking that she and Mr. Sydney are well-suited. Happy endings all round! I started this a while ago, but got distracted…I must make it to the end, which does sound very interesting. Lory, I hope you do give it another try. It is, to me at least, the best of Alcott’s works. What a lovely review of one of my favorite books! This wasn’t included in the box set of Alcott that I grew up with, so I discovered it later, & loved it more. The second half is so interesting, with Polly’s hard work, her cozy little apartment, and as you say, her circle of friends. I don’t mind quite so much about Maud, because I appreciate that Alcott has unmarried women leading happy fulfilled lives. I think Tom and Polly are the happiest and the best suited couple in all of Alcott’s books. Though I have a soft spot for Mac. Lisa, I completely agree with you about Tom and Polly being the best-suited of Alcott’s couples. I like Mac too but he does tend toward high ideals and I think I would find those inconvenient to live with. My favorite of Alcott’s books! I feel the need to go re-read it now as a result of your lovely review. I remember when I read Eight Cousins, and I was so set on Rose and Charlie that when I found out he dies in Rose in Bloom I couldn’t even read the book. Silly I know, but such was I the teenager. This wonderful review has made me nostalgic and craving an Alcott re-read! I wasn’t particularly committed to a Charlie/Rose match but I remember feeling absolutely betrayed by Alcott when she killed him off. I still haven’t completely forgiven her for it; what a cheap trick! It’s only been in the last few years that I even knew that sequels to Little Women existed and now I’m finding out that she has whole other books and characters! What fun you have ahead of you! I really think this is her best book so I hope you’ll try it one day. I loved Little Women and its sequels when I was a child, and after seeing the film this Christmas I picked it up again and was quite surprised by how preachy it was. I do want to go on with it, though, and am curious to see what I’ll think of all four books (which I got as a set for about £1 on Kindle, I’m afraid). As for this one, I read it when young but also more recently and remember loving it. What a great review! Thanks. I can’t imagine how much I would have rebelled if Marmee had been my mother. Movie Marmee is fabulous and empowering; book Marmee would have me running away from home as soon as I figured out an escape route. Just one of the many reasons I prefer this book to Little Women! I don’t think Tom does a quick turnaround, not really. He’s never been thoughtless or inconsiderate, just unfocused and a bit ignored. When he finds a purpose, it seems only right that he would set to it. As for Polly, I’d like to think if I had a brother as eager to go to university as hers and as appreciative of the experience, I’d do everything I could to help him reach his goal. And he certainly appreciates what she is doing for him, which helps. I reread this a few months ago — I was suddenly struck with a vehement desire to read it, and I curled up in bed and read it cover to cover. It’s such a dear book. 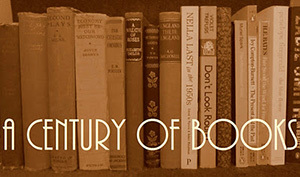 It’s one of those books, isn’t it, where you get an itch to read it? I read it over and over again when I was living miserably in Calgary (back in my pre- and early blogging days). It was so comforting then. I tried reading Alcott when I was a teenager and haven’t picked any of her books up since. I think I kept accidentally picking up the sequels to read, without having read the originals, i.e. Little Men, Rose in Bloom. I do love the film “Little Women” and have always suspected I would prefer it to the book. 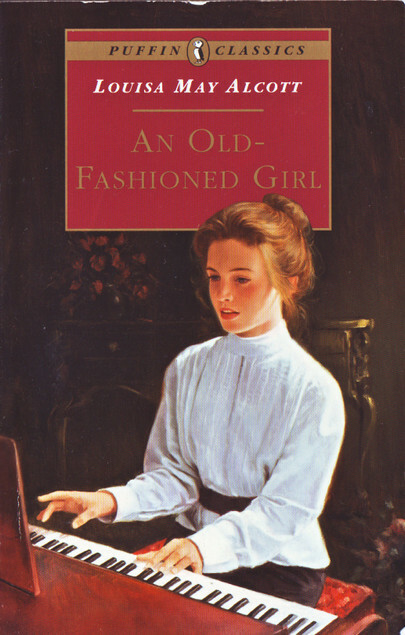 I think I’ll try this book – An Old-Fashioned Girl – instead if I have another go at Alcott. I think nine or ten is prime Alcott introduction age. After that, maybe 25. I could see her being a tough sell to a teenager!